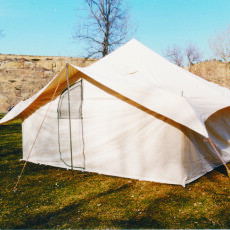 The Big Horn Wall Tent is our standardized wall tent. The Big Horn is offered in two tough and durable fabrics, 10.10oz. Marine Treated or in 10.10oz. Marine & Flame treated fabric. Both fabrics have a breathable, “dry” treatment for mildew and water repellency. The flame treated has the added treatment that meets CPAI 84, an industry wide standard of flame resistance. The flame resistance material is required in California, Minnesota, Michigan, Louisiana, Massachusetts, New Jersey and New York. 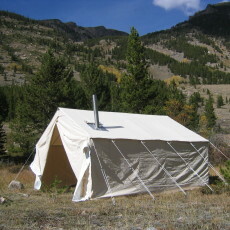 The Big Horn Wall Tent is available in 8×10, 10×12, 12×14, 12×16, 14×16, and 16×20. 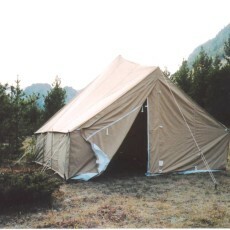 This tent comes standard with a 5′ side wall, sod cloth, stove pipe shield, zippered door and back window. 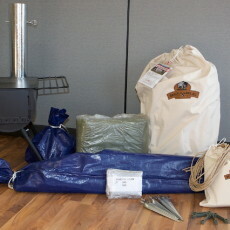 Ropes, stakes, rope tighteners and carrying bag are also standard. You won’t be disappointed with this great tent. Note: Frames for these tents are sold as an option. Click here for Aluminum Free Standing Frame information.